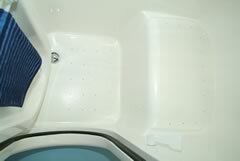 Serenity Walk In Bathtubs continues to be a leader in the design and manufacture of Walk-In Tubs. Serenity Walk In Bathtubs offers both the 26 inch and 30 inch Walk-In Tub, as well as a long list of features and benefits designed to fit whatever need you may have. By offering a full-featured product with the greatest possible benefits, Serenity Walk In Bathtubs hopes to help you enhance your independent lifestyle! Exclusive! Double Water Tight Seal: Features a true Lifetime Warranty.Our Walk-In Tub is the only Walk-In Tub on the market that has an extra double water tight door seal installed at the factory. Our Walk-In Tub only needs one seal to be water tight, but we insist on two. Wide 18 1/4 Inch Door: Makes our Walk-In Tub easy to get in and out of. Our easy access door also features a stainless steel piano hinge, which is far superior to doors that use two separate hinges. Rounded Door: Our Walk-In Tub door is rounded at the bottom so you won't have to move your feet and legs out of the way to close the door. Delta Faucets: Delta faucets brand is known in the plumbing world for being the best in quality. All of our Walk-InTubs come standard with Delta high volume faucets and showers. The faucets that we use are elegant, Roman-style faucets, which fill twice as fast as a standard tub faucet. 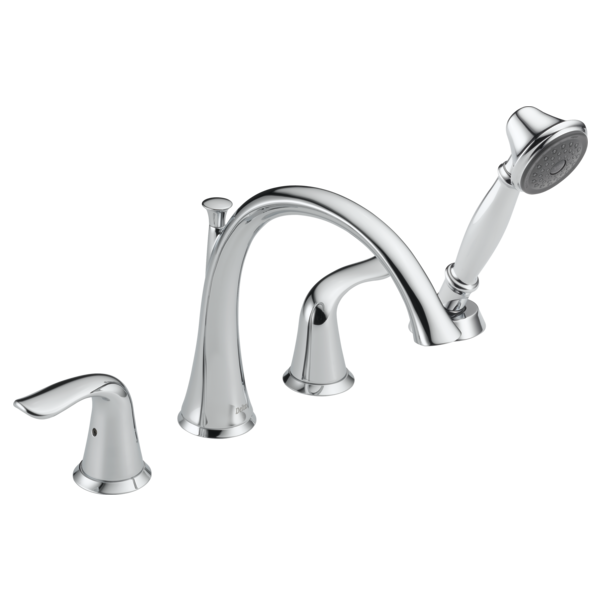 Delta faucets have a Lifetime Warranty and come in several different finishes. Exclusive! Cable Operated Drain: Has an easy to use handle. With our drain system, any person can open or close the drain with very little effort, and without having to bend down or move from the comfort of the seat. Our drain handle is easy to grip and easy to operate. Drains at 13 gallons per minute. Exclusive! The Deepest Soaking Tub:Our Walk-In Bathtub is by far the deepest soaking tub available, measuring an impressive 21 inches to the seat, which allows most people to soak shoulder deep! Our Walk-In Tub is designed for ultimate comfort and relaxation. 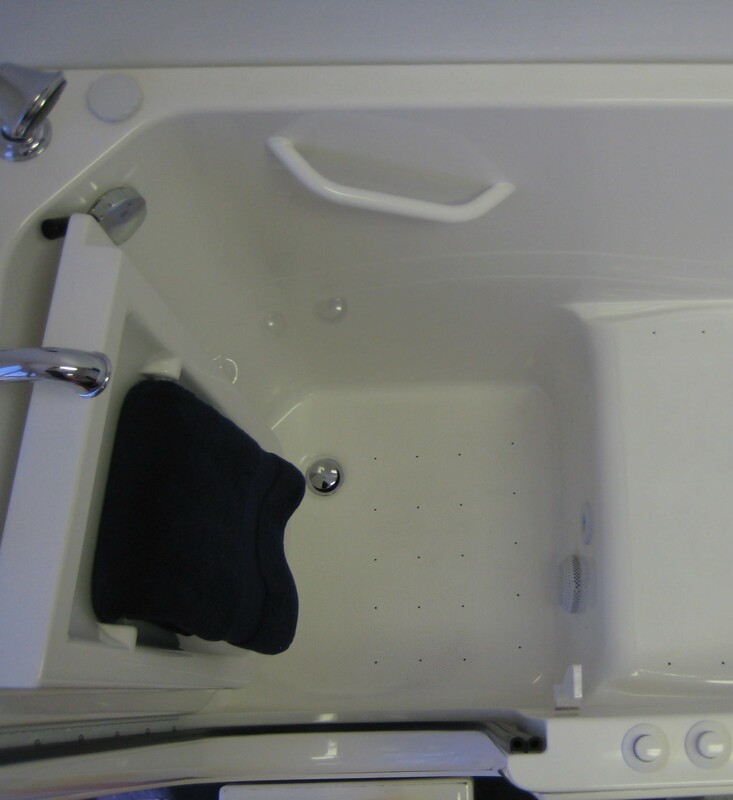 Comfortable Contoured Seat Six Inch Step-in Height: Our low step-in height allows for safe and easy access to the tub, which enhances your independent lifestyle. Optional three inch step is available. Anti-Slip Seat and Floor: The tub floor and seat have a molded anti-slip surface for safety. Anti-Slip Comfortable, Contoured Seat: Our seat makes the bathing experience more comfortable. 16 Inch High Seat: The perfect seating height to ensure your safety and comfort. 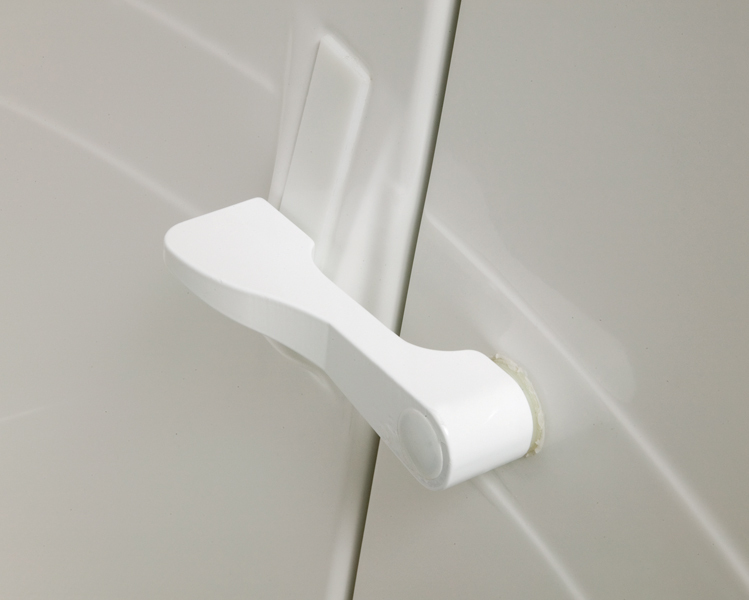 Easy to Grip Door Handle: Our Walk-In Tubs are designed so that any person, regardless of strength or physical dexterity, can easily open and close the door. Adjustable Shower Slide Bar: The adjustable shower slide bar makes it easy to use the Walk-In Tub as a stand-up or sit-down shower. Shower Curtain, Rod, Rings: These features come standard on all Walk-In Tub models. Built-In Towel Rack: So you always have a towel within reach, and right at your fingertips. Built-In Grab Bar: Provides a bathing experience which is a safe and comfortable one. One Inch Steel Frame: Like your own home's foundation, our steel frame is the foundation for our Walk-In Tub's quality and durability. With the steel frame, the tub will never twist or become distorted, which could cause the tub to leak. Our frame has completely welded joints, a powder coated finish, and built to last. Seven Leveling Legs: The seven leveling legs make sure there is plenty of support for the tub, and makes installation much easier. Just twist them down, and lock in place, that's it! New! CozyHeat is the solution for providing warm tub surfaces while waiting for the tub to fill or empty. Within minutes of activating, the bather can feel the heat radiating from the tub surface creating a comforting warm environment eliminating chills. two-speed pump system which makes it easy to find the perfect setting creating a relaxing hydrotherapy soaking bath. our pump system has a self cleaning feature, which automatically turns on after you finish using the tub. The system blows warm air through the lines, removing any excess water left that could potentially grow bacteria or mold. Exclusive! Re-circulation Heater: We are the only walk in tub company to offer a true re-circulation heater. To receive maximum benefit from hydrotherapy, it is important that your water always be at a comfortable temperature. 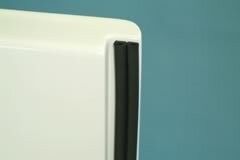 Our heater can continuously maintain the perfect temperature of your bath water, without it ever cooling down. VERY NICE!!! Whirlpool Pump with Six Jets: We also offer this style of pump system on our tubs as an alternative to the hydrotherapy system. This feature is for bathers who prefer hot tub-style jets. These jets can be custom placed to target any particular spot on your body that may need extra attention. Combination Hydrotherapy and Whirlpool System: The best of both worlds, we offer a combination of our two most popular products. Thermostatic Mixing Valve: Many people with diabetes and other diseases have trouble sensing the temperature of water. Our mixing valve is set so that under no circumstances can the water temperature harm any one using the tub. End Panels: These panels can be ordered to fit any side of the tub, so the Walk-In Tub can be installed in any room and in any configuration. Filler Panel: This panel is used to fill in the extra space between the Walk-In Tub and the wall in certain installations. Custom Color Match: We have the ability to custom match your Walk-In Tub in any color that you may desire.